I liked this book and really felt like I was withering along with all the other "brides" of Linden. Imagine a world where women do not live past the age of 20 because of faulty genetic engineering; there is a master race but now boys only survive to age 25. Rhine Ellery had wonderful parents and a twin brother but her parents are dead now and at age 15 she is stolen off the streets of Manhattan and forcibly taken to Florida to be one of the 3 wives of Linden Ashby. Rhine's narrative is strong but very conflicted; she plots to escape and return to her twin brother but she lives like a prisoner in Ashby's mansion. His father, HouseMaster Vaughn is sincerely scary, trying to find the perfect antidote. Rhine sees/finds that he is experimenting on anyone who dies but cannot share this information with anyone. Through Rhine's eyes we see how cold, fake, and eelike Vaughn is but she knows how to lie and play his game. Linden is sheltered, awkwar,d but a husband to 3 women and the love of his life, Rose dies making Rhine promise she will look after him. I really had a tough time liking Linden. He was weak, and he never knows his father is evil incarnate---but his father was experimenting on Rose after she dies, to try and get that perfect antidote. Somehow Vaughn knows everything that goes on in his home. He knows that Rhine is growing closer to the house servant, Gabriel. He knows she tried to escape during a storm and he isolates her and continues to badger hee and stress her importance in keeping Linden happy. 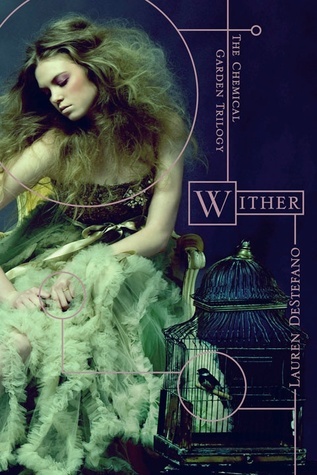 The title of the book Wither was so apt and it is part of the Chemical Garden series. DeStefano does a thorough job of creating a world that is in chaos with a perfect Master Race racing against time to save the children that science has doomed. Since I downloaded the 2nd book on my Kindle, I will be reading it, but I am glad to give myself some distance from the ache of the decay in this first book. Sign into Goodreads to see if any of your friends have read Wither.